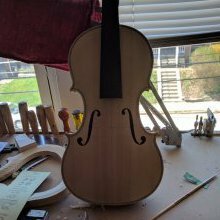 Sometime ago, a 15.5" contemporary trade viola came into my possession with a prominent post-side crack from the saddle to about halfway up the lower bout. Since it cost me nothing, I decided to pop the top and have a go at "repairing" the crack. I made some diamond shaped cleats of modest dimensions and glued them inside while the plate was clamped with the crack closed. The crack was barely noticeable after reattaching the top and the viola played surprisingly well throughout the summer and fall. After the cool weather settled in (the practice room can get down to about 60F overnight), I noticed the crack had opened up significantly. I can easily insert a thumbnail into it, although it has not cracked completely through the surface. 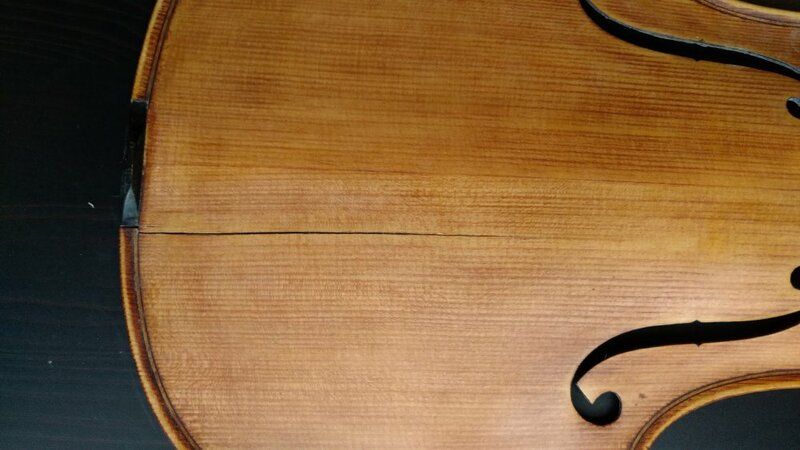 This makes me think that as the viola shrunk a little during the cool, dry weather, the top plate is under some bending stress which has caused the top of the crack to reopen. After seeing a picture of Jacob's repair of a post crack, I realized that my cleats are dramatically undersized across the crack. Which means the crack was probably not sufficiently stabilized against bending stresses that would cause it to reopen at the top surface. So how do you determine what dimensions to make a cleat? How do you determine how many cleats you need and what the spacing between them should be? Thanks in advance four your help. We glue cleats, but it will open anyway no matter what size cleats you use if the glueing is not properly done. The glueing itself is much more important: right kind of glue, right consistency, fitting clamping etc. If the crack reopens and only cleats holding them together, there are not much you can do unless you open it again. You never mentioned cleaning and gluing the actual crack itself, along with the cleats. The original crack was a hairline. It was cleaned and thinned hide glue wicked into it, but it amounted to a miniscule amount of glue. The cleats are still firmly glued to the bottom of the plate. There is no cleat failure. Untensioning the strings results in the sound post falling, and the crack presents itself visually as unchanged, so it does not seem to be an issue of a sound post being jammed into the plates causing the crack to reopen. All of these are good points to consider during a crack repair, but if it were possible to rely solely on the glue in the crack to restore the full strength of the plate, then one would not need cleats. So I am still left with the original questions about how experienced repair people size their cleats. My opinion is similar to Chungviolin's - the failure was most likely caused by an improperly glued crack. Cleats are often unnecessary but I frequently put them in for peace of mind (and for the peace of mind of clients and future buyers). Any crack that is in line with or near the sp should be cleated due to the extra forces near that area. By the way, the sound post shouldn't fall over due solely to reducing string tension. Regarding the size of cleats, it varies. I think Triangle strings has a tutorial on making and using cleats that you might want to check out. 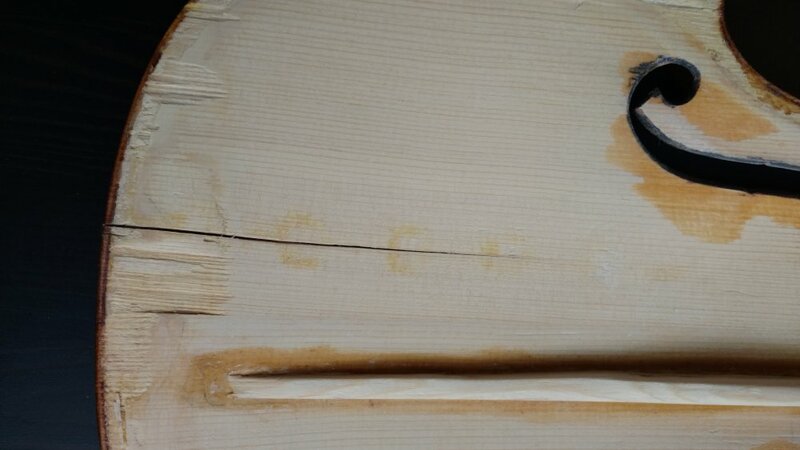 There is the notion that an ideally cleaned and glued crack wouldn't need any cleats at all, since it would be as strong or stronger that the surrounding wood itself. So much depends on the cleaning method (and whether it is even possible to clean some of the worst contaminations), and the gluing technique. We have also just gone through an unusually cold and indoor dry spell, so that needs to be factored in too. Lots of instruction and pictures. The Triangle Strings link was useful. Thank you. It appears that the crack failed in a "cleavage" stress mode. The smallish cleats on the back side acted like hinges. As the viola shrunk in the cool weather the plate flexed like someone grabbed the edges of the bout and twisted them downward. As the crack opened the stress was relieved which made the plate deflect even more. Adhesives can be very weak in resisting these types of loadings. I am thinking wider cleats will resist the bending action that caused the crack to open, and perhaps some modest downward loading of the plate when I reglue it to the garland should add bending prestress to offset the cleavage stress. Or maybe if I reattach the plate in a cool, dry room that would account for environmental shrinkage with no need to prestress the plate. Always a difficult decision about how you get glue into small cracks. If you have to thin the glue too much to get the glue in then it may not be strong enough to hold but I think it'is a bigger problem if the glue doesn't penetrate all the way through. the Seidel violin had had 4 Soundpost cracks, paralell to eachother, which had been glued ot of register from the outside with white glue. I had to painstakingly wash out the white glue, one crack after the other, re-glue, and make a counterform. I made the counterform with thermo-plastic dental compound, which I could correct with a cabinet scraper, and chalk fitted a patch. The length of my cleats is determined by the fact that they each have four cracks to cover. A single crack would have much shorter ones. If you have a soundpost crack, I think you will need to fit in a patch, or if there are other circumstances, we would need pictures to understand your concerns. I use diamond shape cleats, each side is 8 mm, finish it less than 1 mm. Many ppl use square cleats, glueing diagonally. Thanks everyone for taking the time to respond with advice. I will get a some pictures together and post them. To have a crack hinge open that far indicates a pretty serious amount of stress. Is the plate flat when off the instrument? Is the top of the rib garland flat? Those are a couple of things that come to mind. You would need some pretty significant stiffening across that crack line to prevent the hinging, and I'm not sure that normal size/thickness cleats would provide that. A traditional soundpost patch is supposed to perform that function. I believe that Joseph Curtin uses a maple veneer soundpost overlay in his instruments, but that really won't stiffen the area much. Perhaps you could go a step further and overlay a piece of rib stock that would be thick enough to prevent the flexing. When I looked at the cleats more closely, I can see that three of them had spalling, i.e., a bit of the surface fracture off. It is obvious I thinned the edges too much after gluing them in. The edges where the surface splitting occurred were tapered paper thin. Thus I reaffirm my amateur status. There does not appear to be any "gunk" in the crack. Clean with a firm brush and maybe run a stiff wire through to make sure there is no debris adhering to the surfaces? I like the idea of some sort of counter form on the outside surface when gluing it up as the initial repair had a slight offset that could be felt and even seen if one looked closely. Do you clamp the crack dry and get the surface aligned before pouring the mold?
" I like the idea of some sort of counter form on the outside surface when gluing it up as the initial repair had a slight offset that could be felt and even seen if one looked closely. Do you clamp the crack dry and get the surface aligned before pouring the mold? " The counterform is used for support when doing a soundpost patch. The crack must be aligned and glued before even thinking about doing a mold. There are various methods for getting things aligned when gluing a crack. Pillars and wedges, specialized clamps, custom jigs. Keep the plate flat, get the edges aligned, and don't distort the arching. Sounds simple? How close is the crack to the soundpost? If indeed it goes through the post area, cleats won't help, you need a post patch (plaster mold etc). If it is away from the patch, it shouod not be called sp crack, but still has to be glued properly. "Glueing" is one thing ( act of glueing ), "properly glued" is another. The crack stops well short of the sound post area. If I recall from when I first got the viola, the chin rest was clamped onto to top some distance from the edge. The crack started at one end of the saddle where the chin rest rested on the plate. So I guess technically it is not a crack caused by the sound post, but rather one that if it continued, it would pass over where the sound post is typically located to the inside of the upper f-hole eye. The poorly fitted chin rest might have started the crack. The crack passes under the purfling, turns towards the saddle, and proceeds through the edge there. I opened the viola and removed the crappy cleats I previously installed. You can see that the crack stops well short of the sound post area and that the SP area is unmarred. The crack surfaces are very clean, basically raw wood. When I push the crack closed, I get a tight fit along the entire length on the bottom side, but the top has an obvious, but small, gap about 40mm long in the middle of the crack length. No amount of flexing or manipulating the plate can get the crack to close in that area. Do you think a little water in the area might get the wood to swell enough to close the gap? From what I see in the pictures, It appears that the crack is open inside the purfling line but it’s closed from the purfling out to the edge. Given its proximity to the saddle I’d suggest removing the saddle and trimming it a little or maybe even taking a fine saw cut on the right side to allow the crack to close. I’m not sure how tight the saddle is, but it could be exerting unwanted pressure on the spot. You can try moisture or towers to pull the opening shut, but I think that if there’s a major amount of tension required to close it, there’s a good chance it’ll open up again later on. I think rubbing will do the trick. I'm not sure you are familiar with this technique : rubbing it together by holding it with each hand and moving straight up and down opposite direction while pressuring toward each other, (Apply water in the crack) and remove falling fibers carefully, only remove if it's separated from the glueing surface. Keeping them straight up down is very crucial not bending at all, sometimes light clamping (bar clamp) helps while rubbing it. It may take a while depending on the wood, but you should be able to improve the fitting removing gaps in the middle. In your case, you want to rub more on the inside of the crack. Note that there are some similar clamps available for a little less on Ebay, but they don't have any pads on the metal clamp faces(??). That's something that would be a must! It isn't a sound-post-crack yet, but is in grave danger of becoming one if you are not careful. I would start off by making a prophylactic stud, slightly beyond the end of the crack, but still a good way South of the sound-post position, then I would remove the saddle and leave it overnight to see if it goes back on it's own at all. I would shorten the saddle before I re-insert it. I won't water (better carefully wetting) the cracked area, but look if there are some slightly distorted areas nearby (upwards, and they most probably are causing the crack) and wet softly there from inside with paper towels. This would help to close the gap. I get a tight fit along the entire length on the bottom side, but the top has an obvious, but small, gap about 40mm long in the middle of the crack length. No amount of flexing or manipulating the plate can get the crack to close in that area. What do you mean " bottom" and "top " ? It is unclear what you meant. Do you mean " bottom" lower lart of the crack close to the edge, or inside ? Do you mean "top " beginning of ths crack or outside? The whole plate is also called top. With bar clamp and end crack clamp, still you have uneven gap, rubbing is a good way of doing it if you know how to do it. I don't know why FD is against doing it, unless I didn't get what OP meant correctly.